More than 60 percent of initial Social Security disability applications are denied. Yet, many people whose applications are initially denied later go on to receive benefits. The process for getting benefits after a Social Security disability application is denied can be frustrating, but it is important that you don’t give up. Instead, now is the time to plan and to take action to protect your rights. Carefully review the letter to determine why your application was denied. This will help you gather the information that you need to file a successful appeal. Decide whether you are going to file a Request for Reconsideration. If you want the initial eligibility determination to be reconsidered then you may make a formal request for reconsideration. Some applications for benefits are approved during reconsiderations. File an Appeal. You will need to complete the right forms and send the forms to the right office of Disability Determination Services. If you file an appeal, then your claim will be heard by an administrative law judge. Know that you have the right to go to United States District Court. If your claim is denied by an administrative law judge and an appeals council review, then you may need to take your case to U.S. District Court in order to get the benefits that you deserve. While you also have the right to file a new application that is rarely the best decision after your initial application for disability benefits is denied. Take the time to study every aspect of your case and determine the best course of action for you. Relieve you of the burden of confusing and sometimes seemingly impossible paperwork that is required if you are to get benefits. Collect the medical evidence you need to prove your case. File for all necessary hearings and appeals. Provide you with peace of mind so that you don’t worry about a mistake being made with your claim. Our experienced Social Security disability lawyers work hard to give each of our clients the best possible chance of obtaining benefits. Our lawyers understand what the Social Security Administration is looking for and what your case examiner needs in order to approve or deny your benefits claim. Retaining a lawyer may be something you have never done, and you may have many questions and fears about doing it now. But if you have been denied Social Security disability benefits, then you can greatly increase your chances of winning by speaking to someone who fully understands your needs and the legal system. Call us toll free today at 888-904-6847 to discuss your case. You can also fill out the convenient, confidential form on this page for a free case review. You are not making any commitments by contacting us. Instead, you are simply gathering important information so that you can make the right decision that is in your best interests after a Social Security disability denial. So, please don’t delay calling us—the sooner you call, the sooner we can begin working to get you the benefits that you deserve. 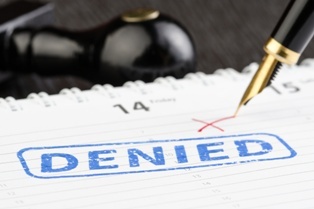 Should I Appeal or Reapply After My Social Security Disability Application Is Denied?